We all owe a lot to Kodak. The imaging company was the forerunner in colour film, but also a largely unsung hero in technological developments: it invented the digital camera and even OLED display technology. That was all before it fell behind the times, sold off the majority of its patents and, in 2012, filed for bankruptcy. The dream was dead. But the memory lives on. For Kodak isn't quite done and has, under license, been releasing a range of products in recent years. And 2016 sees the arrival of the Ektra, a phone-camera that shows Kodak's hunger to climb back up the photographic food-chain. However, and like so many things in 2016 - a year which has been viewed through the rose-tinted nostalgic glasses of those wanting to wind back to imaginary greater times - the shortcomings of a company that's descended so far down the chain that it's slipped off it are evident from the moment we switch the Ektra on. Here's why Kodak is best left as a fond memory, not a sub-par phone in your pocket. Kodak Ektra review: What is it? Is it a phone? Is it a camera? The Ektra wants to be both. Although, at-best, it's a mid-range Android phone with a camera proposition that even on paper isn't really anything beyond its competition. The Ektra's 21-megapixel sensor - the same 1/2.4in size IMX230 chip as found in the 2015 Moto X Play - is paired with a protruding 26.5mm f/2.0 (equivalent) wide-angle lens. Kodak certainly wants you to know the Ektra is camera-focused: the huge circular protrusion to the rear is statement enough. But that's because this camera is optically stabilised (OIS), a feature that not only lacks from a large majority of smartphones, but one that isn't found as a six-axis stabilisation proposition in any phone except for the Ektra. The final point of interest in the Ektra's camera arrangement is the “PDAF” acronym printed on the lens. Standing for “phase-detection autofocus” this actually has nothing to do with the lens itself, but the pixels on the imaging sensor which can offset their readings for focus calculation. However, if you were hoping for a large sensor, such as the humongous 1-inch one found in the Panasonic CM1, then you'll be sorely disappointed. No such luck here. Which, despite physical appearances, leaves the Kodak Ektra struggling to standout. Kodak Ektra review: What's it like to use? As the Ektra is pitched as a camera phone the very first thing we did was fire-up the app. There's a dedicated button, with the Kodak symbol, positioned just a little bit too far up the body. Double-pressing this will launch the camera without needing to sign-in to the phone, or press any power keys. Otherwise the camera app is accessed via an upward swipe of the camera symbol from the Android lock screen or a press of the Camera app on the homepage will also load it. None of these three methods are lightning fast to get you into shooting action, though, which is disappointing. And that's a sentiment that continues throughout the Ektra as a camera experience: focus isn't very fast, despite being phase-detection; close-up focus frequently fails; there's shutter lag; and it often takes a few seconds for an image thumbnail to appear in the gallery so you know you've actually taken a shot. Design-wise the Camera app is trying too hard too: it's opted for a familiar rotational thumbwheel, as you would find on real digital compact cameras, albeit in virtual form. It's far too small, positioned too closely to the edge of the touchscreen and is really fiddly to use successfully. It's been plonked there by a designer whose first job was to emulate a physical design, not to create a usable, considered experience. There are a bunch of modes too: auto, video panorama, bokeh (which fake-blurs the background - but takes 12-seconds to process and often doesn't work at all), night mode, sport, macro (which doesn't work especially close-up), portrait, landscape. Kodak Ektra review: What's image quality like? Whichever mode we've picked we've ended up with oversaturated images and, typically, odd colour balance. Daytime shots have taken on a cool hue, while greens and reds are overly punchy - which we thought was down to the phone's screen, but is actually just over-saturation from processing, as revealed on our Mac's monitor. Low-light has its issues too. It's not so much down to image noise, but this sensor presents some visible banding in shadow areas at what are presumably higher ISO sensitivities (the metadata is hidden from view for some reason). Not pretty. On the plus side is the potential of that six-axis stabilisation. The camera might not be fast, but hold a steady hand and even longer shutter speeds redeem fairly sharp images that we might not get from other cameras. On the flip side, we've had issues in daylight with the lag from shutter to shot being so bad that the result has been blurry (you need to keep fixed in position with the Ektra). In short, then, the Ektra can't match up to other modern smartphones when it comes to ability nor quality. A Samsung Galaxy S7 is hands-down better. 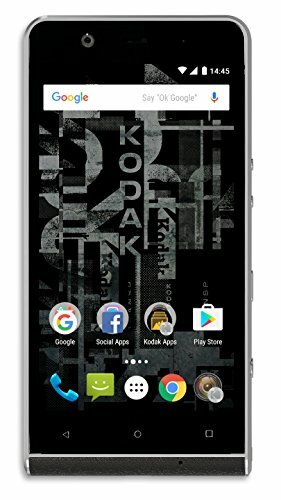 Kodak Ektra review: What's it like as a phone? Despite a camera experience that's not always fast - not by flagship phone standards, anyway - the Ektra functions fine as a phone. When even some flagships, such as the Moto Z, struggle to scroll through webpages, the Ektra shows no such issues. It's not the speediest to load, but things function well once they're in play. Android is largely pure, with only a handful of Kodak apps thrown in as extras. One, Super8, is playful on Kodak's camera and film history. We're fine with the kitsch sentiment, problem is it doesn't work: it failed to “develop” video we shot from the app itself, while the tiny preview screen-within-a-screen goes against the grain of usability. Other apps are quick-access to web help and a Kodak-specific gallery, which is just like a normal Android gallery. Battery-wise, there's a 3,000mAh cell on board, which is a decent capacity. Given the phone body's 9.4mm thickness, though, we would have thought there's scope for even more inside. Note, the lens and grip protrusion make the phone 14mm thick overall, which is big for a phone these days. As phone cameras continue to get better and better, we had high hopes for the Kodak Ektra. Its stance toward being a camera-phone help it to stand-out in a market of otherwise copycat devices that, to many, will be hard to recognise one from the next. Sadly, the Ektra stands out for all the wrong reasons: its specification (ignoring six-axis stabilisation) is middling, it's slow to operate and use as a camera, its images are over-saturated, low-light shots have banding issues, the app is poorly designed and, ultimately, there's little to nothing to save Kodak's attempted reintegration into the camera-slash-phone market. Which all sounds scathing, but that's how we feel this product stacks up. And that makes us really sad because, like we said in our opening gambit, we owe a lot to Kodak for its past history and innovation. The Ektra, however, is best forgotten so we can enjoy those wonderful Kodak moments and memories past instead. Update: 8 Dec, 15:00. Kodak claims to have sent us a "pre-mass production" handset. It is plausible a software update (not possible by over-the-air update) will improve performance issues highlighted above. It might be a lot more cash, but the Panasonic CM1 really focuses on putting the ultimate camera in a phone. With a 1-inch sensor at its core, it's far more adept at imaging. It might not have a big, protruding camera, but the SGS7 knows what it's doing when it comes to taking pictures. The camera is super-fast to respond and great in low-light. Plus, as phones go, this is one of the most fluid-to-use flagship devices on the market. So it's a win win situation... despite the extra you'll need to meet its asking price.